My Labor Day Gift This Morning! Hi friends and happy Labor Day! I’m skipping today’s marry, date or dump to tell you about a funny tradition my family has. I’ve never met anyone outside my family who does this, but just like Santa brings present on Christmas or the bunny brings a basket on Easter, on Labor Day I get a book from Samuel Gompers. Pretty weird, right? When I was growing up, I was told Samuel Gompers brought me a book because he made it so children didn’t have to work in the factories and could go to school. Now I know the history behind Samuel Gompers, one of the most famous American labor rights activists, is more complicated. Yes, he did do a lot of good things, but he also promoted a lot of racism and exclusion within the labor movement. Definitely a mixed legacy. Still, I think it is a lovely, if historically complicated, tradition. I It was great growing up and really looking forward to Labor Day (a holiday most people overlook) and to be so excited about getting . The book that changed my life, Ella Enchanted by Gail Carson Levin, was a Samuel Gompers gift to my sister. 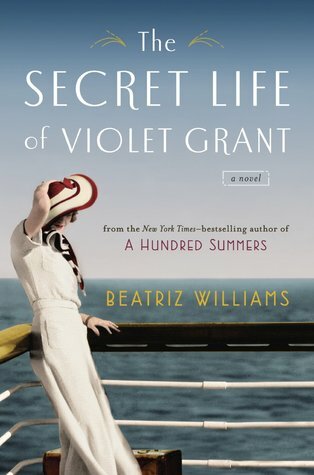 And it was really exciting to wake up and open The Secret Life of Violet Grant, by Beatriz Williams. Well done, Samuel Gompers! Does your family have any funny traditions? Do any of them involve books? Are you going to spend any part of your day off reading? If so let me know in the comments. This entry was posted in Uncategorized and tagged books, Labor Day, Samuel Gompers by Alison Doherty. Bookmark the permalink. First of all, I absolutely love this tradition. Any holiday that equals books is magic in my eyes. Second, I can’t wait to hear what you think of this book! I loved A Hundred Summers, so I’m anxious to pick up this one too! That’s a pretty cool tradition. I’ve never heard of anyone else really celebrating Labor Day. And, yea, history is complicated. Thanks! Yeah, I’ve never heard of anyone outside my family celebrating Labor Day either.